Cleaning out drawers last weekend, I took a minute to fiddle with two slide rules that I inherited, one from each of my grandfathers. I’ve always found them to be a mysterious link to the past, where clever tricks made all kinds of things possible that we take for granted today. I’d like to be able to make more use of them, but they’re just not that practical any more. Yesterday I stumbled on a link to a gallery of similarly outdated but intriguing tools called nomograms, which are graphical solutions to equations. Ron Doerfler assembled a calendar for 2010 featuring a number of intricate nomograms. He updates his site infrequently, but I certainly hope he is able to put together a similar calendar for 2011. I will definitely check back later in the year! It will be good for engineer‐cred. 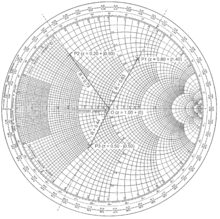 As an electrical engineer, I still have nightmares about trying to understand Smith charts in college. The Smith chart is another type of nomogram used for a number of purposes, including matching components, transmission line characteristics, and other high‐frequency uses. Again, the chart is fascinating to look at, but it’s really a product of the black arts. Stay away. 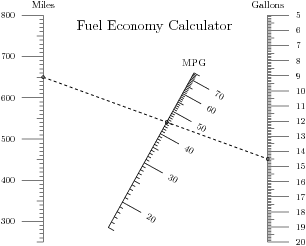 Thinking more about where I’ve seen nomograms, I recall on highway maps there used to be a fuel economy calculator. There were two horizontal lines and a diagonal line between them. On one horizontal scale, you would select how many gallons it took to fill the tank, and on the other, you would choose how far you went on that tank. The center scale showed the car’s fuel economy for that tank. For the life of me, I can’t find any examples online, so I tried out PyNomo to create one of my own. In the example above, I went 650 miles on a tank of fuel, and it took 14.5 gallons to refill the tank. The line between those two points intersects the MPG scale at about 45 MPG. The PyNomo site has some additional examples that fly way beyond my comprehension, but they are neat to look at. I also found a nomogram for homebrewers to calculate IBUs, and one illustrating the operation of planetary gear set in a Prius.